The Choose a Scholarship Query feature is used for queries that have been previously registered. Administrators though are allowed to choose the data they wish to have exported. 2. Click Financial Services | Scholarship Query. Note: Once Scholarship Query has been selected, users may then be prompted to re-enter their credentials. 3. A screen will display the following options: Build a Scholarship Query, Choose a Scholarship Query, and Request a Scholarship Query. 4. Select Choose a Scholarship Query from the list. 5. Enter the scholarship code into the field and click Search to view the scholarship query. 6. Select the student information you wish to appear on the query list. Click Export My Scholarship Query once all information has been selected. 7. 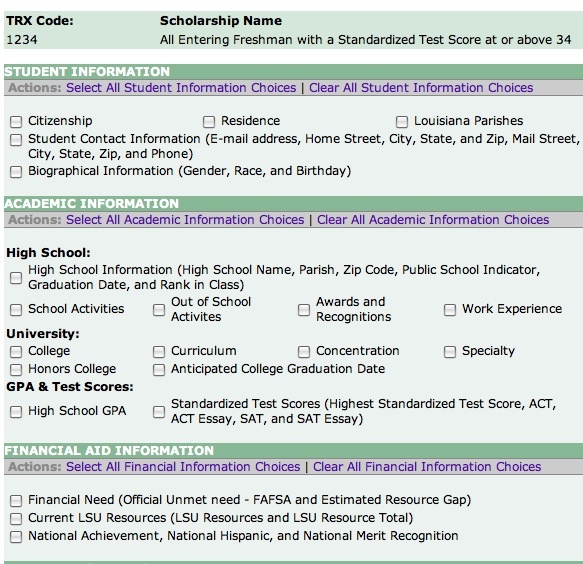 A student scholarship query should then be built displaying the requested student information. The query will be saved as a .xls file and be available for viewing in Microsoft Excel. Note: The query lists each qualifying student by ID Number and displays all student information selected in step 4.